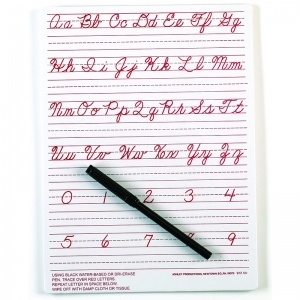 Helps with learning how to write out letters and numbers! Use in the classroom or for home learning! Damp wipe pen included for continuous practice! Each board is 9" x 12". This classroom set includes 12 durable masonite lap boards that are red and blue lined on white board and 9" x 12". 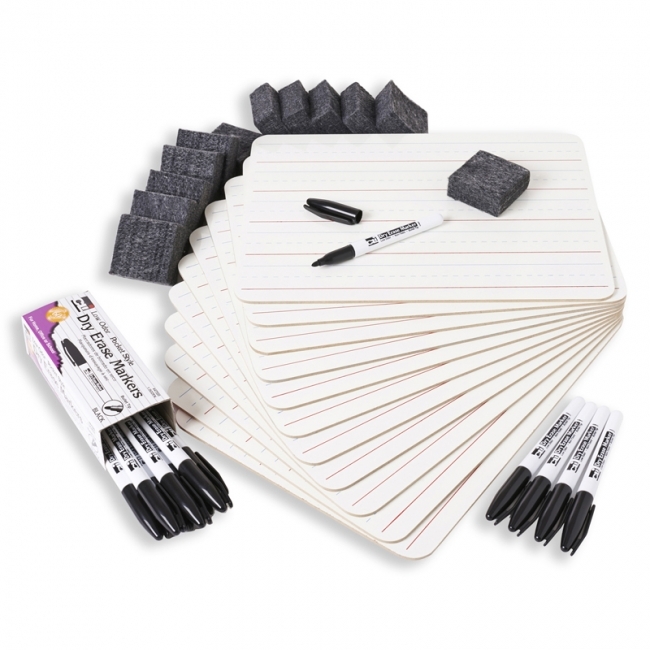 Also included are a box of 12 Pocket style dry erase markers with bullet tips in black and a 12 pack of 2" multi-purpose erasers. An environment friendly way to learn, as you just write, wipe off and re-use with no waste. 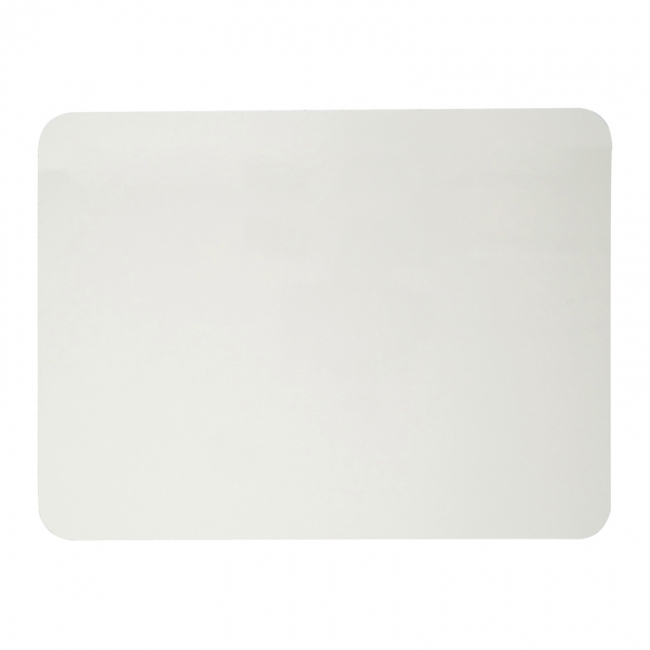 This classroom set includes 12 durable masonite lap boards that are dual sided, plain white and lined. Boards are 9" x 12". Also included are a box of 12 Pocket style dry erase markers with bullet tips in black and a 12 pack of 2" multi-purpose erasers. An environment friendly way to learn, as you just write, wipe off and re-use with no waste.Markers are AP Certified, Conform to ASTM D-4236. 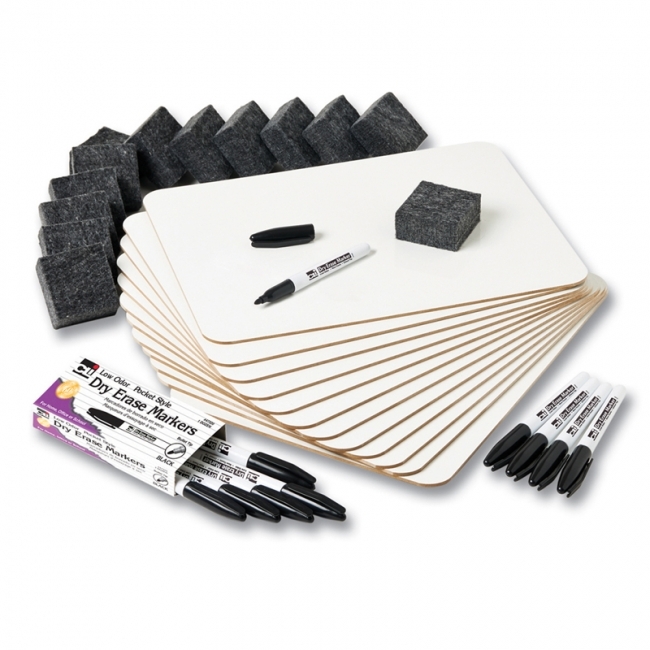 This classroom set includes 12 durable masonite lap boards that are plain white and 9" x 12". Also included are a box of 12 Pocket style dry erase markers with bullet tips in black and a 12 pack of 2" multi-purpose erasers. An environment friendly way to learn, as you just write, wipe off and re-use with no waste.Markers are AP Certified, Conform to ASTM D-4236. 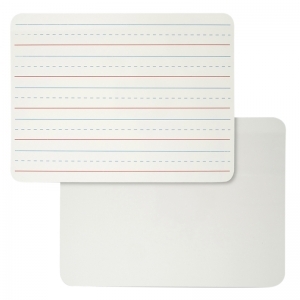 This classroom set includes 12 durable magnetic lap boards that are dual sided, plain/plain white and 9" x 12". Also included are a box of 12 Pocket style dry erase markers with bullet tips in black and a 12 pack of 2" multi-purpose erasers. An environment friendly way to learn, as you just write, wipe off and re-use with no waste. Markers are AP Certified and Conform to ASTM D-4236. 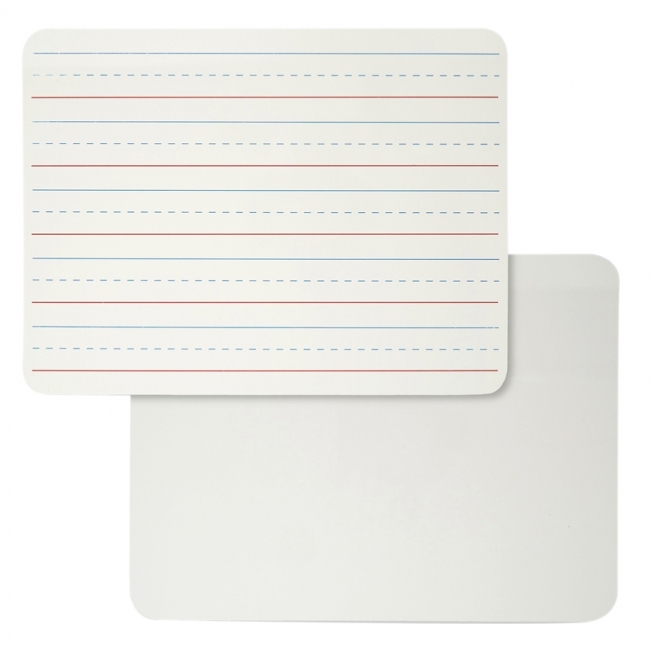 This classroom set includes 12 durable magnetic lap boards that are dual sided, plain/lined white and 9" x 12". Also included are a box of 12 Pocket style dry erase markers with bullet tips in black and a 12 pack of 2" multi-purpose erasers. An environment friendly way to learn, as you just write, wipe off and re-use with no waste. Markers are AP Certified and Conform to ASTM D-4236. Great for classroom games, math lessons, reminders and all assignments. Durable masonite lap boards are 9" x 12" and can be used with all dry erase markers. An environment friendly way to learn, as you just write, wipe off and re-use with no waste. 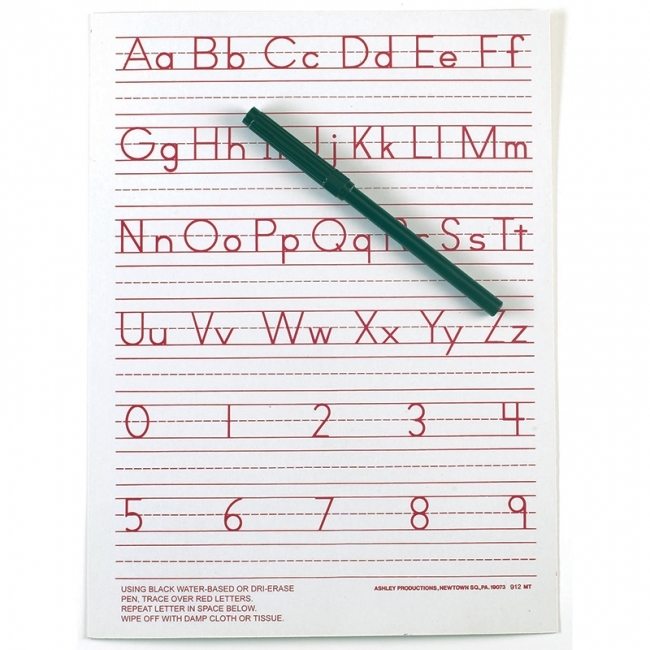 Pre-printed lines offer a great work place to practice penmanship, sentence writing and more. Durable masonite lap boards are 9" x 12" and can be used with all dry erase markers. An environment friendly way to learn, as you just write, wipe off and re-use with no waste. 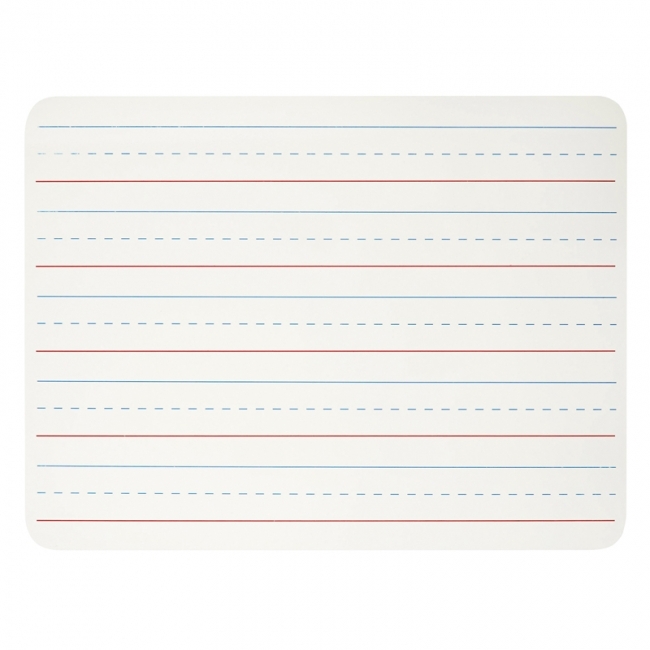 Dual sided, pre-printed lines on one side and blank on the other offers endless uses. 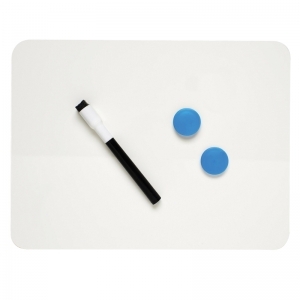 Blank side works great for classroom games, math lessons and reminders. While our pre-printed side is great for penmanship and sentence writing. Durable masonite lap boards are 9" x 12" and can be used with all dry erase markers. 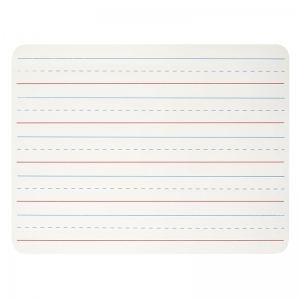 An environment friendly way to learn, as you just write, wipe off and re-use with no waste. Magnetic dry erase lap board that is also dual sided. With pre-printed lines on one side and blank on the other, this board offers endless uses. Blank side works great for classroom games, math lessons and reminders. 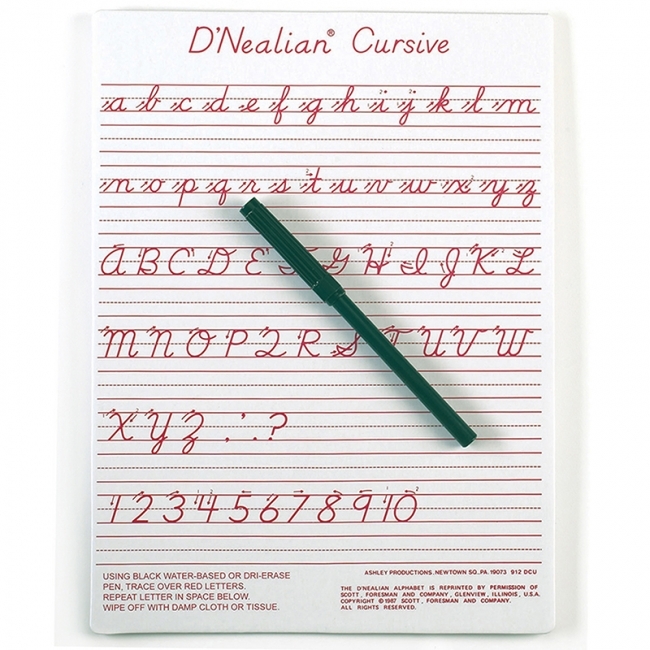 While our pre-printed side is great for penmanship and sentence writing. 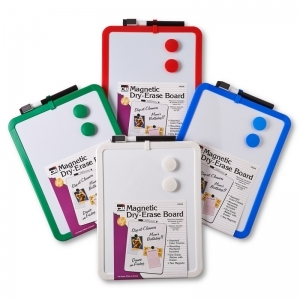 Durable magnetic lap boards are 9" x 12" and can be used with all dry erase markers and any magnetic eraser, or magnets to help organize your supplies. An environment friendly way to learn, as you just write, wipe off and re-use with no waste.